First African American faculty member at the University of Southern Califonia to be named a full Professor. 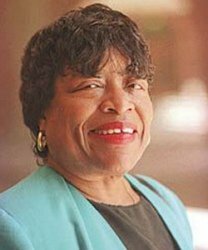 This pioneering Soror and scholar became dean of the USC Graduate School, the first African American to hold a deanship at the University of Southern California. She was named Vice Provost for Graduate and Professional Studies and Dean of the Graduate School (1988). In 1994, she was appointed Vice Provost for Faculty and Minority Affairs, a position she held until her retirement in 1998. She also held the David Lawrence Stein/Violet Goldberg Sachs Professorship of Social Work. Prior to moving to California, she was the only African American Field Work Supervisor at the Veterans Administration Hospital, Houston, Texas.